Humorist Calvin Trillin had this to say about leftovers: The most remarkable thing about my mother is that for thirty years she served the family nothing but leftovers. The original meal has never been found. While I can say with certainty the origin of our triple-header leftover saga was the gut-busting feast of Thanksgiving, it's not an unknown occurrence in the Wasabi household to have leftovers stretched to near-infinite meals. For better or worse, my parents never liked to throw out food, and that mentality of "waste not" was forever drilled into my Wasabi brain. Our current surplus of ham, turkey, stuffing, and cranberry sauce led to this Episode I, II and III of meals: Thanksgiving Skillet Hash, Thanks-for-Giving Savory Bread Pudding, and a Truly Leftover Turkey Ramen. Skillet hash is probably one of the most leftover-friendly meals to make. It's UnRecipe to the tenth power, as no measuring or ingredient-fretting is needed. Depending on how many hungry people are needing to be fed, you just take a bit of protein like a handful of finely chopped ham and turkey, add something starchy, which in our case was the leftover roasted sweet potatoes, and throw it all in a heated skillet. The fat from the ham and the turkey skin melts down a bit in the pan, creating a nice sizzle for the sweet potatoes. 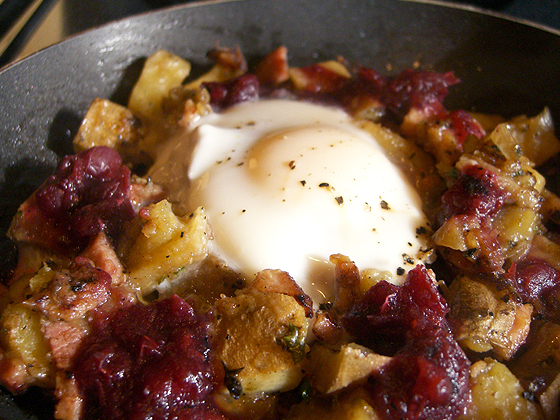 I also scattered a bit of cranberry sauce over the hash to give it a little tartness. Once everything is fully incorporated and heated through, make a shallow little well in the hash and crack an egg right in. Depending on how many people it's being made for, one egg per person will do. Turn the heat down to medium and cover the top of the skillet with a bit of tin foil to trap the heat and cook the top of the egg to whatever doneness you prefer. I like the consistency of a poached egg, so I let the top of the egg get a bit opaque but the yolk is still liquid inside. Depending on how large a skillet and how many eggs are being used, this final step should only take a few minutes. Everything was already well-seasoned from their past life as a dinner, so no salt or pepper required. I do like Tabasco with my eggs, so I added a splash or two right before the omming and nomming. The Thanksgiving Skillet Hash was made across several breakfasts, and more than a couple of times, I made this for a party of one because we have a couple of small pans. Yes, I did eat it right out of the skillet, furthering solidifying my membership with the Seattle Skillet Sensation Club, a secret society of plateless skillet-eaters created by foodie blogger and future chef, Eric Rivera. As Rachel of Laptops and Stovetops fame noted, if eating out of a skillet is wrong, I don't want to be right. Amen to that. Thanksgiving Leftovers, the Sequel turned into a savory bread pudding. We wound up with a refugee band of dinner rolls and despite our tendency to leave out breads and pastas in our meals, the voice of my parents' Waste Not wisdom was in back of my mind like Obi-Wan. Or perhaps it was Lord Vader of the Carbohydrate Dark Side. Either way, I wanted to use up as much of the Thanksgiving leftovers as possible. Cubing the rolls and letting them toast in the oven to dry out, I took all the rest of the ham and turkey and chopped it into bite-sized pieces. There wasn't really any measuring involved in this UnRecipe because it was one of those "stone soup" meals that just uses everything available. Savory bread puddings, much like a skillet hash, have that lovely flexibility when it comes to ingredients. If they paired well as a meal of main courses and sides, there's no reason they can't be mashed together as a leftover delight. I used the remaining half-and-half from the coffee and dessert portion of Thanksgiving to make a loose custard for the oven-dried cubed rolls. It was maybe a half a cup's worth. Mixed with a couple of eggs, the creamy, viscous liquid soaked into the now-crispy breadcubes. I probably could have skipped the oven-drying of the bread, but I like taking all the moisture out of bread first, so that it soaks up whatever new liquid and flavor that's being reintroduced to it. 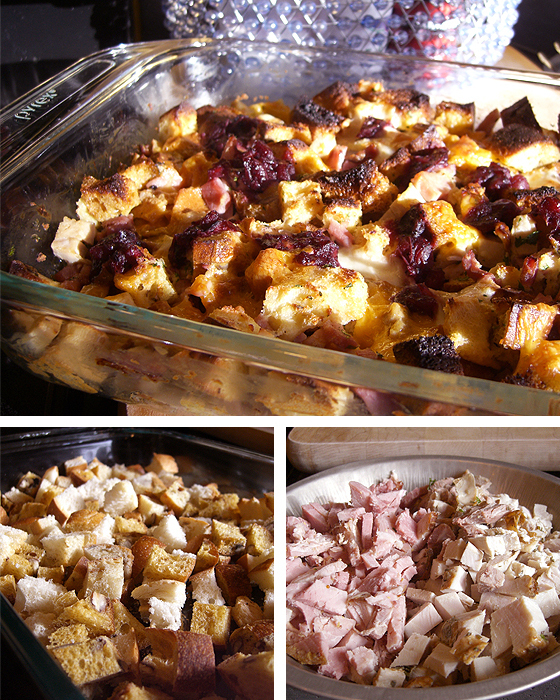 The ham, turkey, stuffing, and remainder of the cranberry sauce was already cooked, so once the bread was fully soaked with the custard, the savory bits were tossed with the bread, and a few slices of remaining cheese from the appetizer course of Thanksgiving was laid over the top to create a melty topping in the oven. Again, because everything had been pre-seasoned, I added maybe a few cracks of pepper and that's it. The oven set up the pudding, leaving the bottom part creamy and fused together, while the top crisped in the dry heat. Sliced into wedges, this made for easy lunches for the week. The final meal that furthered Thanksgiving leftovers into the realm of, "Holy Hell, aren't you sick of this yet??" used the most basic, but flavorful part -- the turkey broth. I still had several cups' worth of a concentrated turkey stock made from the whole bird. Some of it was originally used for gravy, but the rest was reserved knowing it could be used for a number of things. I had seen a number of soups and stew recipes flying around on blogs and Tweets, but at this point, I had been sick with a cold and a craving for ramen won out in the end. Feeling too sick to hit the store and the fact that most of the Thanksgiving remnants were spoken for, it became a resourceful ramen that came together with pantry items and basic ingredients. When the sniffles hit, some people crave chicken soup or grilled cheese sandwiches -- mine is either miso soup or ramen. 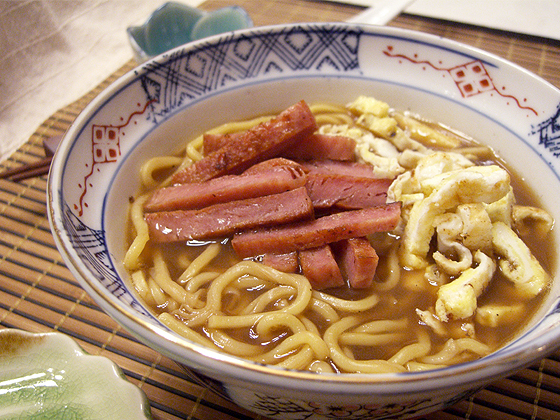 More to the point, I crave a Hawaii-style saimin, which uses a thinner shoyu broth and yes, Spam is involved. Be it ever so humble, there's nothing that eases my sickly aches and pains like a savory, salty broth with chewy noodles, shredded fried egg, and slices of fried Spam on top. The ramen dashi came together with all the remaining turkey stock, water to thin it out, a splash of vinegar, several splashes of soy sauce, and a stalk of lemongrass (I keep them in the freezer; you'll be thankful if you do the same). The resulting flavor was a salty, sour broth that isn't necessarily traditional, it was just what my flu-riddled palate needed. I had the fortune of finding a few packets of fresh noodles stashed in the freezer. They weren't the firm, wrinkly Hilo-style saimin noodles I love best, but given my state of health, I wasn't about to complain. Maybe waving the banner of Team Leftovers makes the Prime seem extra provincial, but I don't think it's too shabby a thing to think fast in the kitchen and cook by the seat of one's pantry. Given my newly-minted status as a Lady of Leisure, I anticipate many more at-home meals of UnRecipe inspiration. Did we grow up in the same household? We ate leftovers all the time and about once a week would have a "hodge podge"--the bits and pieces of other dinners. I really loathed those dinners. But as an adult, I hate to throw out food and find myself serving all kinds of unusual inventions. Funny how that works out when you're the one buying it. Anyway, your concoctions look fab, particularly the bread pudding! And ramen is definitely my favorite thing to eat when under the weather. Hope you're feeling better. I love it! 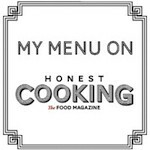 This is a great collection of yummy left over recipes and I love that you did another take on turkey ramen! Nice work, as always. Sounds like you ate well even though the flu attacked. Happy Holidays! I f'ing love this! Thanks for the shout out! Using what one learns when cooking from recipes in ones own creations - skillet sensations or otherwise - is very liberating. Its a great way to clean out the fridge too! great ways of using leftovers. Turkey stock is a must if you roasted a whole turkey yourself. The ramen soup looks good and simple. Bread pudding looks great too. I'm a big fan of your unrecipe because I normally cook without one also. Great ideas for leftovers! all look delicious, but I'm glad I don't have any left. My turkey was terribly dry! This post points out the down side of going out for Thanksgiving dinner. No leftovers..............Great post - I love hash. You really did make good use of all those leftovers. Looks fantastic! Good job.